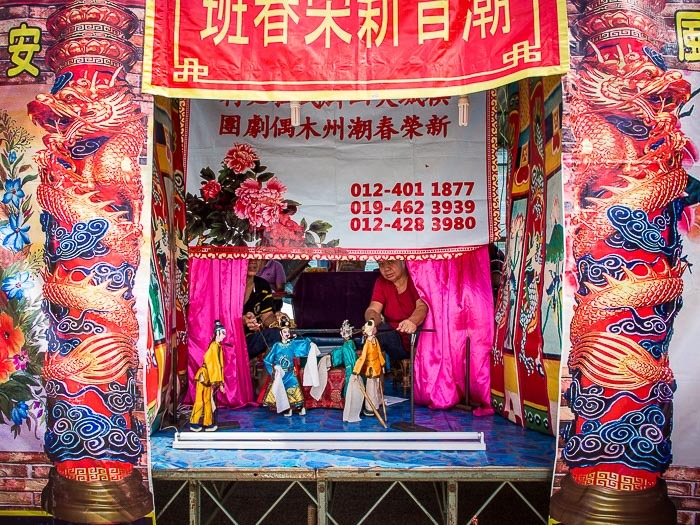 Chinese Opera performed with puppets at a temple in George Town. I've photographed a lot of Chinese Opera since coming to Thailand. I've photographed five just this year. 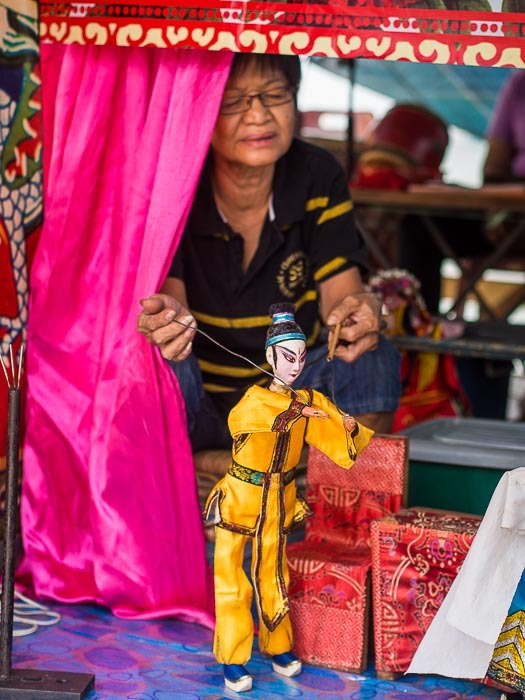 The Taoist "Nine Emperors" festival coincided with our visit to George Town. The festival ended the day before we arrived but some of the temples and shrines still had operas going Saturday night. We missed those because we were photographing the Navratri procession. 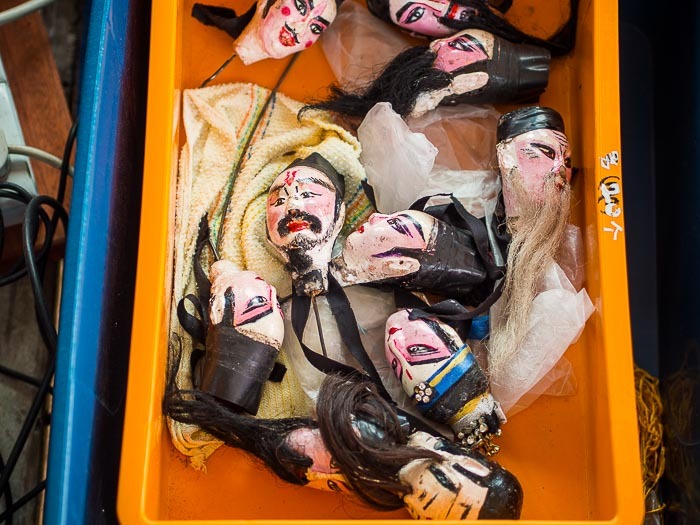 Puppet heads in a box backstage. We were wandering around the "Clan Jetties" along the George Town waterfront and heard the gongs and trilling of a Chinese opera in the neighborhood. I ran to the end of the jetty and a resident told me the opera was at a temple on the next jetty over. We quickly made our way to the next jetty only to be told that it was on the next big jetty. We ran back to the road and hustled down to the end of the big jetty. 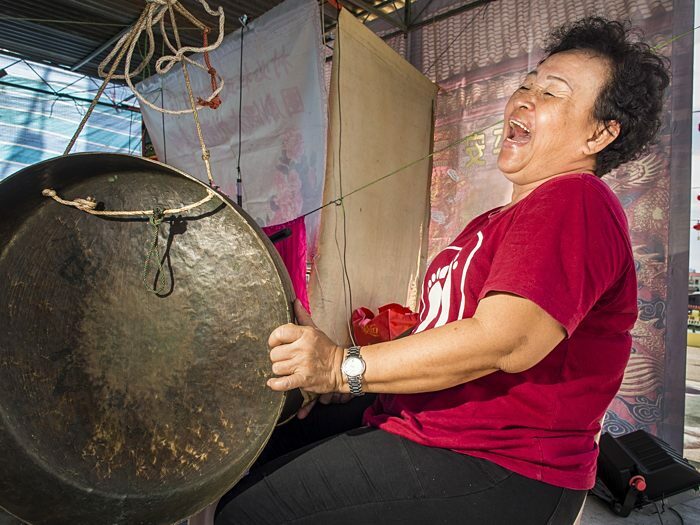 A musician at the opera plays her gong and sings. At the temple I was confronted by the smallest opera stage I had ever seen. I thought this surely couldn't be right. The stage for the opera. The puppets are about 18 inches (45 centimeters) tall. But it was right. It was the most unusual Chinese opera I've seen so far. 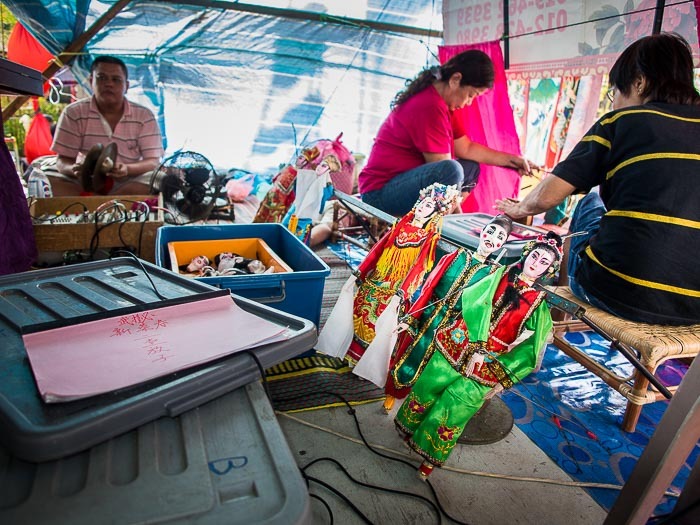 The musicians also provided the vocals and two women manipulated the puppets. I made a few frames from the edge of the platform they were performing on and while they were singing one of the women pushed aside some costumes and motioned that I was welcome to photograph from the their platform. So I climbed up on the crowded and platform and made a few photos. Backstage at the puppet Chinese opera. The women on the right are manipulating the puppets, the man on the left is running the sound. The performance ended about five minutes after we got to the temple, so I didn't make many photos, but it was fun and unique and totally unexpected. There are more photos of the puppet opera in my archive.